I’ve tried many forms of student written reflection in my classroom. No matter the format, I have always phased them out due to the administrative details and increased time burden. I liked the idea of having students reflecting on their learning, and believe in the benefits of writing across all curricular areas. What I needed was an easy way to orchestrate the process. I used my google account to set up a Google form. If you do not already use Google drive, it’s time to start. When you have your form, click “Send Form” and copy the generated URL. Take that URL to any QR code generator. This link was the first that came up on my Google search. Download that QR code from the website, and name it accordingly. Print off multiple copies of each code and place around the room in areas easy for students to access. I have created a couple “hot spots” in my room to avoid crowding while students herd to complete the slip. It is also an option to print the QR code directly onto a course syllabus. I find that students lose these papers, so class hot spots are a safer bet. The last piece of the puzzle is the students and their smart phones. Have them download a QR Code Scanner onto their device. There are plenty of free options available. Various apps are available across almost all devices including iPhone, iPod, Android phone, iPad etc. With three or four minutes left in class, have students find a “hot spot”, scan the code, and fill out the form. I would recommend practicing this once before you want to collect actual data. All responses are automatically collected and organized into a Google Spreadsheet. Accessing the file from Google Drive makes collecting timestamped data simple. I have found that the students love the process and that is a victory in itself. Save the website for your results spreadsheet in your browser bookmarks. Quick access will mean you will use it more. Take advantage of the digital format. Copy and paste the text from the Google spreadsheet into wordle.net and create a visual of the student thought. After you have read through the responses, delete the rows of data before you have students respond again. This will allow you to keep the same form and same code. If you do not delete previous responses, you may have trouble seeing which responses come from which days. All the responses are timestamped, so this is not necessary. I just don’t like the file to swell too large. 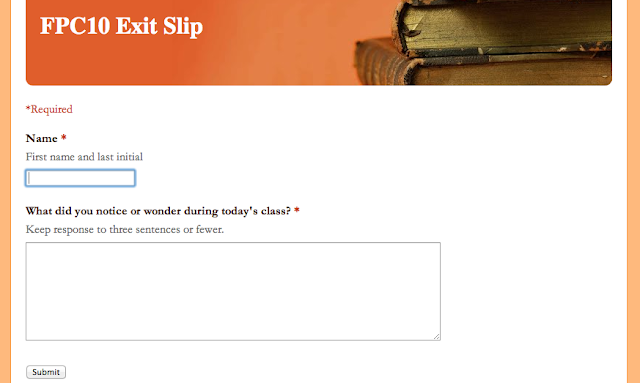 Exit slips provide students the opportunity to communicate troubles, ask specific questions, comment on class structure, summarize learning, or clarify their thinking. This digital curation system is quick to set-up and even quicker once you are accustomed to the infrastructure. If you have any specific questions or extensions of the process, I’d love to hear them. Tweet at me (@NatBanting) or leave a comment below. Question: What about students without a smart phone? I think the % of students with a smart phone in my classes is pretty high, but its not 100%. I guess I could let them jump on my CPU or use my phone, but then they are being more singled out for not having an iphone. Great question. I forgot to address this. In my class, the ratio is around 85% access. In order to fill in the gaps, I give out the complex URL to kids to complete on a library computer at a later time. This is less than convenient for them, but saves the "singling out" you speak of. I simply ask students to share phones. If they are done, pass your phone to a friend. Only if there is a student isolated without the tech do I hand out the URL. Several colleagues have suggested printing the QR codes onto sticker labels and having students place on their binder or notebook. I love this idea, and am trying to implement ASAP. Thanks to everyone for the ideas; keep 'em coming! I love the idea of exit slips. I love the idea of digital exit slips even more (especially since I'm a huge fan of Google forms and QR codes)! This is such a great way to get feedback from the students to use as a formative assessment. Thanks for sharing your creative twist on exit slips! Using bitly to shorten the URL is a method I have used to get kids to a google form that works well.